On Saturday night at the San Diego Comicon, the 2018 Prism awards were announced. The goal of the awards is to recognize, promote and celebrate diversity and excellence in the field of queer comics. 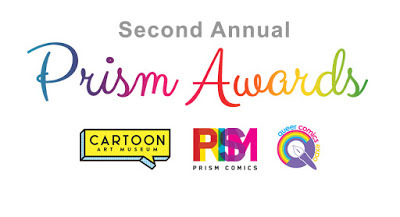 Prism Comics does a lot of great advocacy for LGBTQIA creators and readers and our own Rob McMonigal was one of the judges and presenters for this year's awards. Here's the list of nominees, with the winners highlighted in bold.